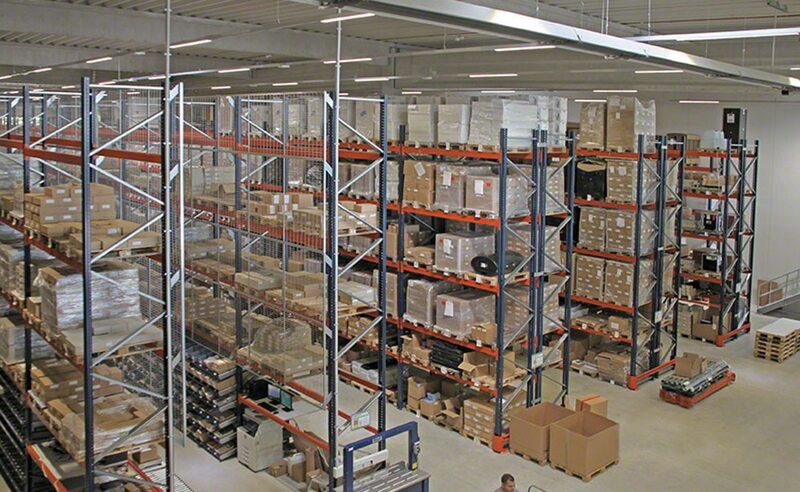 Mecalux has equipped the Company 4 Marketing Services warehouse in the city of Neufahrn bei Freising (Germany) with the pallet racking system. The racks provide a storage capacity of 2,253 pallets and, also, maximise the throughput of the centre’s primary operation: order picking. Founded in Ismaning (Germany) in 1995, Company 4 Marketing Services GmbH (C4) offers marketing services, providing its customers with an added value in everything from the design and production of advertising materials, even printing and delivering them as requested. All through a single provider. The services it offers include the storage and shipment of marketing materials (catalogues, brochures, etc. ), for both large and small companies that wish to promote their businesses. Company 4 Marketing Services owns and operates two modern warehouses north of Munich, located close to the main national highways and the international airport. The company needed maximum storage capacity, with products sorted as per their characteristics, turnover, size and SKU type. Furthermore, it required a solution that would ensure speedy picking and consolidation of orders. After an in-depth analysis of the requisites presented by Company 4 Marketing Services, Mecalux set up the warehouse with pallet racks that provide a storage capacity of 2,253 pallets. Racks are 7.5 m high and 42 m long. It is a very versatile system, which adapts to any unit load type, weight or volume. Direct access speeds up the management of goods and order preparation. In addition, it guarantees perfect stock control, since each location is assigned to a single SKU. The distribution of goods in the warehouse means operators’ movements are organised and optimised when carrying out warehouse and order fulfilment tasks. Lower levels of the racks have a place for order prep, which is set up in two different ways: either collecting entire boxes directly from the pallet, or individual small sized items from the live picking storage shelves. On the other hand, the upper levels house pallets of reserve product. These live picking shelves are comprised of slightly inclined roller tracks, so boxes slide via gravity. Items are taken from inside the first box, and reserve product boxes accumulate behind. The main advantage of this system is picking and replenishment of goods can be done at the same time, without any interference between the two operations. Operators insert boxes into the different levels in the loading aisle and these move to the opposite end on their own. Attached to the racks, a free rolling, non-motorised conveyor acts as a prep table so that operators move boxes manually to the most suitable position. Operators collect products from the racks that run down both sides and place the items inside the order box. Once the order is complete, the operators take it to the consolidation area. There the weight is verified, and it is checked for errors. Last but not least, the boxes are closed, packaged, labelled and issued delivery notes and documentation. In front of the loading docks is a wide receiving and dispatching area, including space for ground level preloading. Pallets are grouped as per the order or route before they are loaded into the distribution vehicle. Accessible goods: this system facilitates direct access to the goods, which streamlines storage and picking tasks. Well used space: the entire warehouse surface has been fully utilised to obtain the large storage capacity that was needed for such a sizeable number of SKUs. Adaptable picking: by organising goods according to their size and turnover, operator workflows are optimised during picking.